The UK has some fabulous diving in her seas, not least on the hundreds of wrecks. There is also beautiful marine life and at times stunning visibility. You will need a drysuit, or a 7 mm wetsuit with hood and gloves. When is the best time to dive the UK? September and October are the warmest months for diving, February and March the coldest. You can dive all year round, using inland sites when the weather is rough. See also our Diving the Isle of Man section. On Midsummer Day in 1919, German Admiral Ludwig von Reuter ordered the German High Seas Fleet to be scuttled. Seventy-four German ships had been anchored at the Orkney Islands of Scotland. They were sunk to prevent them being divided up amongst the allies. Many of the ships were recovered for salvage; but those remaining submerged have helped make Scapa Flow into one of the most popular dive sites in Europe. As well as the WWI wrecks, there are many "blocking" ships. These were deliberately sunk during both wars to prevent access into the bay by the enemy. Additionally, there are more recent wrecks such as the James Barrie. The wrecks are not only interesting in their own right but are covered in marine life. Dive boats in Stromness and Kirkwall take you out to the wrecks. You can dive all year round at Scapa Flow. August, September and October have the warmest water but this can coincide with algal blooms giving poorer visibility. The best vis is between December and March, but days are short and the water cold around 7 °C. The diving season runs from April to October, with You can dive all year round though. For more details we recommend the Scapa Flow Dive Guide. One of the last blockships to be sunk. She is upside down with numerous entry points and has been voted the best dive in Europe. 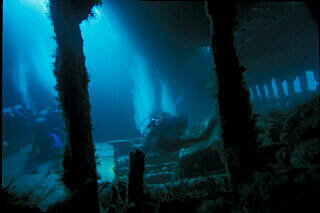 The wreck lies between 14 and 18 m and needs to be dived at slack water. You can do it as a shore or, more usually, as a boat dive. She is covered in anemones. The Tabarka was built in Rotterdam in 1909. "Tabarka gets my vote - I dived it a few years ago now: and the memory is still fresh in my mind. It was stunning"
"In 18 m this wreck was scuttled to prevent submarine attack during WW2 and is a 2000t steamer built 1909. Boilers and reciprocating gear intact, covered inside with marine life, anemones, lobsters, starfish, urchins and wrasse. Easy penetration dive, hull very open many access and entry points, light streams in. Wonderful dive"
"All the wrecks are cool, but this shallow 18 m dive is a real beauty. One of the block ships, but only dived on slack as the tide when rushes and you would not want to be inside it when its running. Luckily all Skippers from Stromness are class. Covered in life, gin clear water -like a cathedral a beautiful place. Worth the trip and the one of surprises of Scapa." The James Barrie was a fishing boat which ran into Louther Rock in 1969. The crew abandoned ship but some hours later she floated off by herself. A lifeboat took her in tow, helped by two fishing boats. Ice in the hold of the James Barrie had plugged the hole in her, but as the ice melted the sea rushed in. The tow lines were cut and the James Barrie sank. 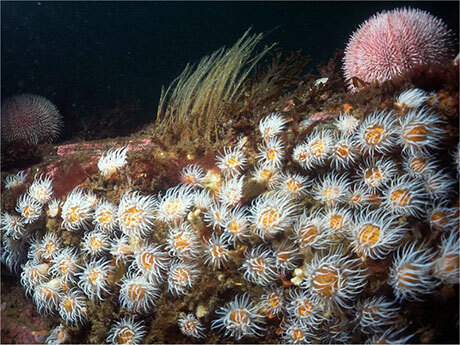 She lies at 42 m. Intact, she is covered in hydroids with plumose anemones. "Amazing to find such clear conditions at 41 m in UK waters. A great dive. The most intact of the German High Seas Battle Fleet. A light cruiser, she now lies on her starboard side. "Fantastic historic wreck. Mostly intact (some evidence of salvage operations) lying on its side. Guns still intact, good vis. loads of life." One of the World War II blocking ships. Rises out of the water: you clamber on and dive down through one of the hatches. 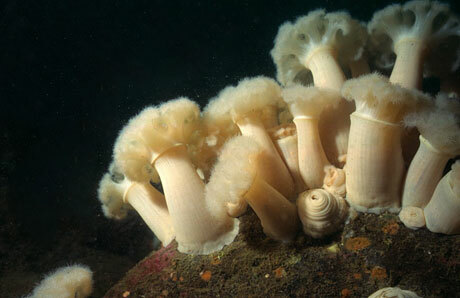 Many plumose anemones. Light German cruiser scuttled in 1919. Built 1913 and used as a mine layer. Superstructure intact and guns still in place. 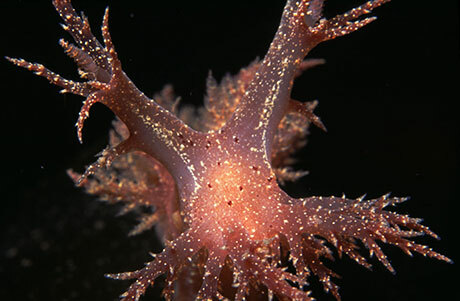 Covered in life including brittle stars, feather stars, sea urchins, crabs and plumose anemones. 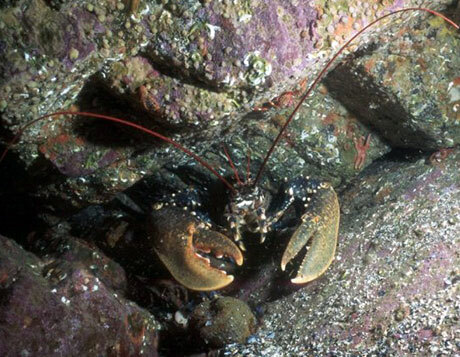 "I've been diving for a few years in various parts of the world and if you don't mind the cold then you could do much worse than dive the wrecks of the Sound of Mull on the west coast of Scotland. There are lots of dive operators and lots of dives for people of various experience. 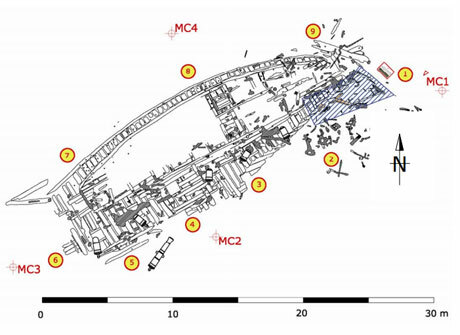 Lots of wrecks: The Hispania, Thesis, Shuna and Rondo just to name a few. The best part is even if you're not into wreck penetration the life on the wrecks is just as worthwhile." "The best wreck in Britain. Very intact, picturesque, covered in life. This volcanic archipelago, with its spectacular landscapes, is situated off the coast of the Hebrides and comprises the islands of Hirta, Dun, Soay and Boreray. According to UNESCO, it has some of the highest cliffs in Europe, which have large colonies of rare and endangered species of birds, especially puffins and gannets. The archipelago, uninhabited since 1930, bears the evidence of more than 2,000 years of human occupation in the extreme conditions prevalent in the Hebrides. Human vestiges include built structures and field systems, the cleits and the traditional Highland stone houses. The diving around St Kilda is beautiful with great visibility. Many photos of the underwater life of St Kilda are in our British Isles photo gallery. "Oceanic blue water and visibility. The only dive site in Britain which is outside the green coastal waters. Highlight? 7.5 lb lobsters!" " Pick from any of 2000 wrecks - pick the right tides and auto 25 metres viz. " "Farne Islands in North East England - amongst Grey Seal colony numbering 6,000." " Capernwray, the nationally acclaimed diving centre located inland just outside Lancaster. Capernwray is set in a disused quarry and has a depth of around 18 metres with extremely clear water and 18c temperature which is 10c less than we have been used to in Egypt. To add some additional interest to the shoals of fish including the most human friendly rainbow trout that investigate every diver as they enter the water. The owners of the centre have added a couple of helicopters, a few boats including an old minesweeper, a diving bell, a cannon and a fantastic 120 seater passenger plan, plus two huge plastic horses named Shergar and Lord Lucan that were originally part of the Blackpool illuminations. We spent most of our first dive in and around the plane. As we got down to around 15 metres we approached the plane from the front, a sight that was kind of eerie, first you see a large shadow, then the nosecone and then the cockpit and wings; it was awesome. The doors and seating have been removed and the tail section is separated from the main fuselage which makes it easy to access and swim around, it does test ones buoyancy. As a disabled person I have to say that it was the easiest access I have had onto a plane for the past 22 years. As we prepared for our second dive of the afternoon we noticed a large number of people arriving and marquees being erected close to the water's edge. We were informed that they were preparing for the Great Northern Swim, a sponsored event that had been transferred from Lake Windermere due problems with toxic algae. Our second dive went really well, we looked around the minesweeper, next onto an old cruise boat and then one of the helicopters. Before we knew it we were getting low on air and it was time to call it a day. But as we surfaced none of us could believe our eyes, we have an audience of over 500 people eagerly waiting for us to get out of the water so they could start their swim. I’m told that the owners of Capernwray are planning to add a Blackpool tram; I can't wait for the opportunity to actually sit on the top deck of a tram for the first time in 22 years." "A liner in 50 metres, midway between France and England in the Channel. Very good viz on the slack. Copious large cod and pouting. Some splendid crabs and lobsters. Brilliant cold water dive. "12 miles off Plymouth, England. Reef rises from sea to depth approx 50 m. Encrusted with jewel anemone. Remains of ancient wrecks, including large 17th century anchor. Stunning! " "At Plymouth there are the two classic dives: the Egan Layne and the Cilla, both close to each other. There are various inshore and off shore sites around the breakwater: broken up wrecks etc. There is also diving at the Eddystone Reef. There are a couple of dive shops near the harbour who can refill your air and maybe get you on a dive boat. Slightly further afield Looe divers run a boat out (you need two tanks) with them to inshore wrecks and the Kanton Buckets, about thirty mins from Plymouth a little further near Mevagissey." Lundy Island is a marine conservation zone lying in the mouth of the Bristol Channel. It is extremely rich in marine life, has 10 diveable wrecks and generally has great visibility. Small, it is three miles from end to end and just half a mile across. You can read more on the marine conservation zone here. "There are three pinnacles which can be reached all within one dive. 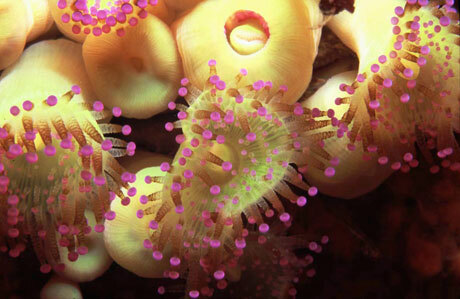 Vast amounts of jewel anemones, cuckoo wrasse, edible and spider crab. Edible urchins as big as a football, amazing. " The MV Robert sank in 1975. It is buoyed and lies between 18 and 25 m. You can easily enter the hold. "Wreck covered in plumose anemone, lots of life around and inside the wreck itself. Large conger and a resident lobster that must be at least 80 yrs old, fantastic dive. " Lundy Island is famous for its colony of around 200 Atlantic grey seals. These are playful and curious. "Shallow bay entry but surprising gully to the right with an abundance of life and it drops to 13m to a sandy floor with cuttlefish. Am only a beginner that can dive above 18m but it is a beautiful dive when the sea is calm. " "Not very deep with 4 entries, 3 to the left of the car park and 1 on little fistral. Are seals on the right and loads of crabs muscles fish etc. " "Sharks, wrecks and superb Fauna. " The Colossus was one of Nelson's gun ships which first set to sea in 1787, She was 170 feet long and 50 feet wide. She was anchored in the Isles of Scilly in 1798 waiting for favourable weather, bound from Naples to Portsmouth with Greek pottery for Sir William Hamilton and wounded personnel following the Battle of the Nile. During a storm the anchor cable broke, leading eventually to distress signals being sent out. Men from the local islands set out in open boats to rescue the sailors. After several hours, all 840 men were saved. 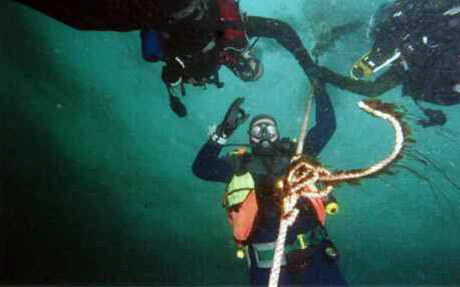 To salvage the iron from the ship the navy employed two divers, Tomkin and Braithwaite. They had a semi-armoured diving suit supplied with air from the surface. They successfully raised many large guns from the Colossus. Thirty-five years later the Deane brothers worked on the wreck. They invented a helment coupled to a flexible diving dress that was fed by a powerful surface pump. Their design was used until SCUBA was invented after the 2nd World War. Part of the Colossus had been discovered and excavated in the seventies by Roland Morris. Todd Stevens though found extensive wreckage and historically important artefacts well away from the recorded site. He wrote a book about his experiences. You can read our interview with Todd here. 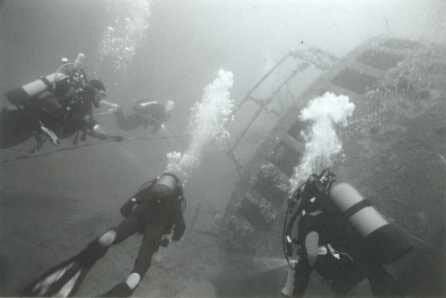 The wreck is protected under the Protection of Wrecks Act 1973, but you can dive it along a "dive trail". It lies off Southward Well, Samson Island at latitude 49.92336167 and longitude -6.34341845. The dive trail comprises numbered observation stations situated around the site and a waterproofed underwater information booklet which explains the exposed remains. You need a visitor's licence which a local dive company can arrange for you. Built in 1943, HMS Whirlwind was a Royal Navy destroyer. In the 1950s she was converted to an anti-submarine frigate and was used in the cold war. She sank in 1974 whilst being used for target practice. The wreck lies on its port side. GPS co-ordinates are 52 16.791N, 004 40.527W. "WW2 destroyer sank in the 70's, awesome, lots of fish, good viz lots of light 36 mts"
A coal cargo ship, the SS Vendome sank in 1888 just 6 years after launch. She lies between 28 and 35 m. On her final voyage she was travelling between the Isle of Man and South Wales when she hit a rock. The wreck lies off Portgrain. "Victorian steamer on reef, plenty of life 32 mts. " Torpedoed by a U-boat while on route for Derry in 1944. 29 men were lost. "Shallow wreckage of US liberty ship with caves and seals, good viz. " In the UK much of the diving and diver training is via a BSAC Club. BSAC training covers many skills from the beginning, like rescue, that you need to pay extra with a PADI centre. There are of course also many commercial centres offering PADI, BSAC and other courses and diving opportunities - one	of these may be a better option if you are pressed for time. If you live in Britain the cheapest way to go diving, though, is by joining a club. "PADI Open water course £299.00 including equipment. One of the best learning experience, and adventurous experiences I have ever had. Their "tailored to the individual" approach and sense of fun made learning to dive thrilling, and enjoyable. I will be going back to The Cornish Dive School for all my future PADI Training. Excellent value for money. " "Excellent help when buying new equipment. Staff are genuinely interested in getting the customer the best deal on the gear most suited to their needs and scuba style." "£30 a guided dive. Various dive sites visited like Port Gaverne, Newquay Headland, Swanpool. Driven to dive site, lunch supplied, kit available to hire when with them on a guided dive. An excellent service with tea/coffee as soon as you get out and up for a really good laugh. Have a caravan there for divers to rent. Can sleep 6 and only £60 a night for the caravan no matter how many are staying. A+++ caravan with all the amenities and a great balcony to sit and talk about the days diving with a bottle of wine. The whole package is well worth the money, £60 a day for the caravan, 2 dives a day £60, as well as first class instruction when needed from a 5 star padi IDDR. I am agoraphobic and find it extremely hard to be around people and Mark and the Staff make me feel welcome and relaxed so easily so is the best and only place I would go in Cornwall to dive so far. " Organise trips to Lundy Island. Organise trips to Lundy Island, Cornwall, Portland, Plymouth and the English Channel. Most of their diving is around the coastline of Kent with its huge abundance of sunken shipwrecks. Provides tailored PADI and IANTD diving courses. Belper Leisure Centre on Wednesdays @ 8pm or afterwards at the Greyhound Inn on Whitemoor Lane from 9pm. Affiliated to the British Sub-Aqua Club. BS-AC Club meets every Monday between 8pm and 9pm in the Main Pool at Fit City Broughton Pool and later at the nearby Cricket Club fon Mondays from 9.30pm, (26 Catherine Road, Crumpsall, Manchester, M8 4HF) . BS-AC Club meets every Wednesday. From 9pm til 10pm at Urmston Leisure Centre on Bowfell Road in Flixton. BSAC Club meets Thursday evenings at Irlam and Cadishead Leisure Centre from 19:30pm-20:30pm then Irlam Steel Works Club, Liverpool Rd, irlam, Manchester M44 6APIrlam Steel Works Club, Liverpool rd, irlam, Manchester M44 6AP, Thursday evenings from 20:40pm -22:30pm from 20:40pm -22:30pm. Family diving club based on the banks of the River Mersey on the Wirral peninsula. Welcome divers of all abilities, agencies and their families. Club Night: Thursday 7:00pm. Pool Training: Thursday 7:30pm. Socialising in Clubhouse after the Pool 8.30pm onwards. Ocean Quest provide training, travel, educational programmes and equipment hire and sales covering a range of activities including diving. Hard boat charter packages with accommodation. Wandrin’ Star is 48ft and the largest diving charter hard boat operating in Pembrokeshire. She offers ample deck space for twelve divers plus their kit. "Loads of sites for all abilities, deep wrecks 40+ - also plenty of shallower wrecks and reefs. Boat: Wandrin' Star with accommodation package, works out at £ 150 per diver for a weekend if you have pax 12 Have been before and will be going again. Very good value for money. Lovely boat, knowledgable skipper, great accommodation. " On Midsummers Day in 1919, a German Admiral ordered the German High Seas Fleet to be scuttled. Seventy-four German ships had been anchored at the Orkney Islands of Scotland. They were sunk to prevent them being divided up amongst the allies. These and other shipwrecks have helped make Scapa Flow into one of the most popular dive sites in Europe. Covers 10 of the best wreck dives in Scotland: Hispania, Rondo, Breda, HMS Port Napier, Wallachia, Akka, San Tiburco, Fram, Köln and Kronprinz Wilhelm. Mostly covering the south of England, and just dives above 18 m.
Well presented book but just covers the south of England. Organised as an identification guide, what makes this book so special is the commentary on the behaviour of the animals featured. And the 350 delightful photographs. Unlike some guides, there are no blurred or cloudy images here. Every photo makes it into the book on its own merit. Large online database about wrecks in Britain and around the world. Please send us your comments on the UK. Do you want to recommend a diving centre or dive site? Let us know. If you own a dive centre get yourself added.